ACOUSTIC WEEK: Being able to rock an acoustic is all well and good, but if you want to start playing to more than living room’s worth of people, you’ll need some form of amplification. Ahead, you'll find a host of amps that will project your playing to your audience, whether that’s in a crowded club or on a busy street. And if you're looking for an acoustic to go with your spangly new amp, take a look at our guide to the best budget acoustic guitars in the world today. The Boss Acoustic Singer Pro takes the acoustic amp 'portable PA' philosophy a stage further by adding advanced facilities, connectivity and useful multi-effects that serve both guitar and vocals. A host of effects are onboard this 120-watt combo, including chorus, delay/echo, reverb, harmony (via real-time key/chord analysis of the guitar input), anti-feedback and a built-in looper. Add in XLR DI jacks and a USB output for recording, and the Acoustic Singer Pro ranks among the most fully featured acoustic amps on the market. 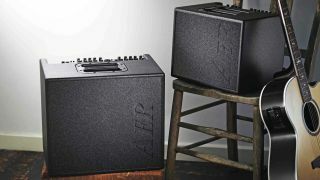 The latest from acoustic amp specialists AER is the professional’s choice and has seen use with a wide range of artists including Tommy Emmanuel and Martin Taylor. It boasts a loud yet crystalline output from its compact frame, not to mention twin-channel flexibility, a smattering of effects, and guitar and mic inputs. Not just renowned for punishing rock amps, Marshall has a line in loud acoustic amps, too. The AS50D features two eight-inch speakers, plus a tweeter, to deliver full-range acoustic sounds. It does a good job with vocals and backing tracks, too. Add in the low price tag and this makes for a tempting all-in-one solution. According to Roland, the AC-33 is the world’s first battery-powered amp made specifically for acoustics, which makes it a top choice for buskers on the move. Its stereo configuration outputs 30 watts of power while two channels, an auxiliary input, built-in tilt-back stand and even a phrase looper ensure you’ll draw those crowds. The latest foray into the acoustic amp world from Brit brand Laney is the A1+, a value-for-money 80-watt combo that’s packed with features. With two independent channels, auxiliary input, full EQ sections plus tweeter and bass driver speakers, the A1+ is sure to sound huge on stage. You can even mount it on a pole stand for increased projection. Extra sonic innovation. Fender’s latest acoustic offering gives you 80+80 watts of stereo power through a clever three-speaker arrangement optimised for wide sound dispersion. Two versatile channels, built in effects and plenty more. As well as producing some of the world’s best acoustic pickups, Fishman also makes amps. This 120-watter features two input channels, a dual effects section and, most importantly for the live performer, controls to banish feedback. All of that makes it perfect for small acoustic gigs while its light weight ensures you’ll have no problems lugging it to your next appearance. The two-channel Jumbo features 2x8 custom Celestion speakers plus a custom HF tweeter. Channel one features an XLR/jack combi input that is designed for a mic input, with phantom power and simple volume, bass and treble rotary controls. Channel two has a standard jack input and is designed for your instrument's onboard pickup, with the same three rotary controls but added input level LED, active/passive push-switch, a phase switch and pre-set EQ shape switch. This addition to Yamaha’s lunchbox-sized amp range features simulations of classic mics, plus high-quality effects to polish your acoustic sound. While its five-watt output may not be enough to accompany you to the stage, its surprisingly punchy stereo projection and battery operation make it a handy portable amp for busking and café gigs. Want your parlour to sound like a dreadnought? Fender’s Acoustasonic gives you that ability courtesy of its voicing control, which also offers a range of electric guitar amp models. Elsewhere you get an eight-inch low-frequency driver and high-frequency tweeter, plus an XLR line out, USB output for digital recording and Fender’s String Dynamics control to tame harsh treble sounds.